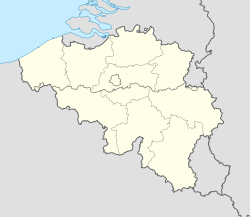 Pepingen (Dutch pronunciation: [ˈpeːpɪŋə(n)]) is a municipality located in the Belgian province of Flemish Brabant. The municipality comprises the villages of Beert, Bellingen, Bogaarden, Elingen, Heikruis and Pepingen proper. On January 1, 2006, Pepingen had a total population of 4,352. The total area is 36.05 km² which gives a population density of 121 inhabitants per km². This page was last edited on 13 January 2017, at 07:31 (UTC).